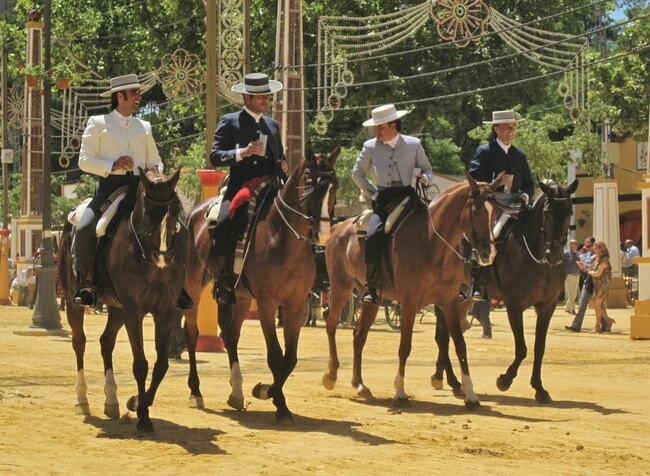 Southern Spain is famous the world over for its stunning horses and spectacular displays of horsemanship. The region’s rugged landscape and beautiful beaches also make it a great spot for a riding holiday, so read on to discover the coolest horse-riding hotels in Andalusia. 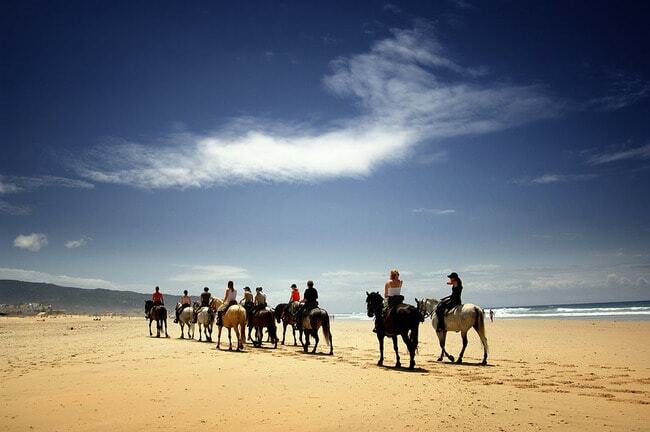 Boasting a spectacular location on an umblemished white beach in Tarifa, the southernmost point of mainland Europe, Hotel Hurricane offers some of the best riding holidays in Andalusia. Attached to the Morrocan-style accommodation – centred around tropical gardens and an irresistible pool – are the hotel’s own private stables. From these, guests are offered riding tours on the virginal beaches, among the sand dunes and through the inland countryside on beautiful Andalusian horses. Doubles are light-filled and reasonably priced, offering either sea or mountain views. 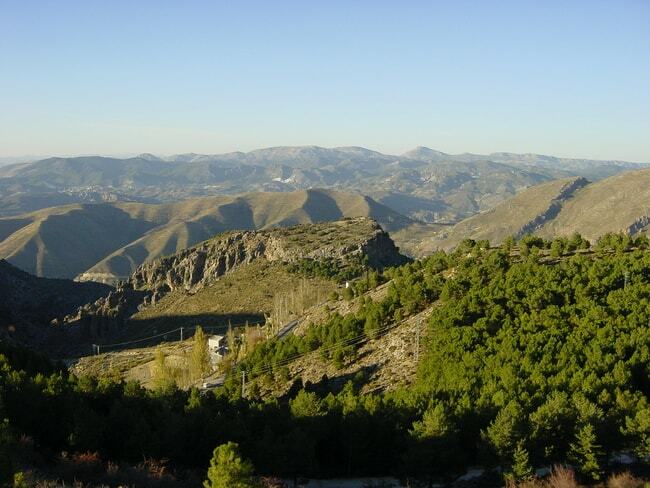 Hotel Zerbinetta is a large, comfortable country hotel located near the village of Dilar a few miles outside Granada. 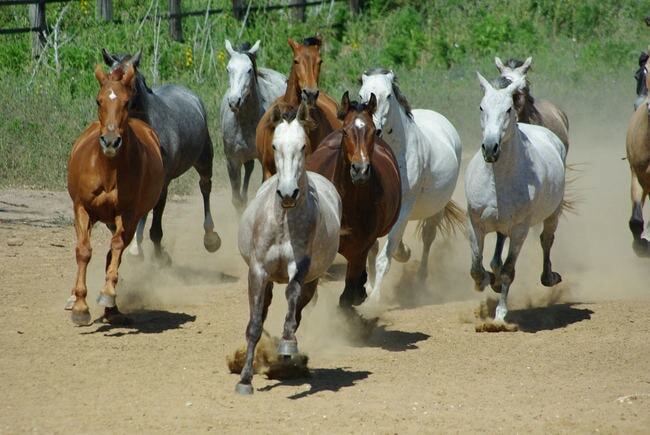 From the Alayos Equestrian Centre – a small cluster of stables located directly next to the accommodation – knolwedgeable staff will take you on hacks of up to several days through the wild and beautiful terrain of the Sierra Nevada National Park. Such is the hotel’s location that the crisp peaks of the Sierra’s highest mountains are clearly visible from its stunning outside terraces and some of the luxurious doubles. Zerbinetta also offers a pool set in attractive gardens, a bar and restaurant and guided excursions to Granada and the Sierra Nevada. 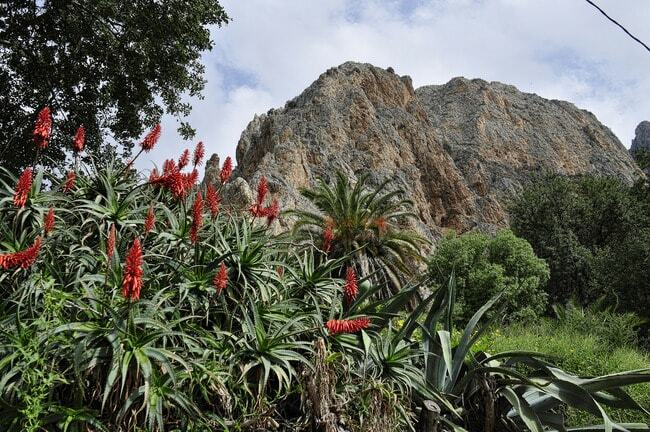 Situated in the wild Alora region of Málaga, Cortijo Valverde consists of seven casitas – ‘little houses’ – that have been converted from stables into bedrooms with oak beamed ceilings, in the traditional rural Andalusian style. The hotel arranges hacks in the surrounding countryside for every level of ability, from two-hour excursions to half-a-day rides that include drinks and tapas at an old farmhouse. Particularly special are the monthly nocturnal rides which take place under the full moon – unforgettable three-hour excursions that are broken up with moonlit wine and refreshments on the summit of El Hacho mountain. Located about 18 miles out of Seville, Epona enjoys a bucolic setting near Carmona, one of the oldest continually-inhabited dwellings in Europe. Guests are not only offered accommodation in an exquisitely-restored 14th century palace, but they also have access to one of the best equestrian centres in Andalusia, with former Olympic medallist Rafael Sotto offering dressage classes for advanced riders. The hotel’s excursions are for riders of all skill levels, and include a spectacular route into the uninhabited expanses of Doñana, one of Spain’s most beautiful natural parks. Horse-riders staying at this old farmhouse near Jerez can take lessons with Manolo Rodríguez, the finest practitioner in Spain of Doma Vaquera, a style of horsemanship used in the rearing of fighting bulls. Also offered to guests at El Tesorillo II are a range of gentle hacks out into the surrounding countryside, as well as riding lessons and equipment rental. And when it’s time to kick back after a day’s cowboying or cowgirling, the hotel’s superb facilities include a private pool, beautiful gardens and terraces and hunting lodge-style lounges decorated with old riding gear. It was on this vast family-owned estate in Jerez that some of the first Andalusian horses were bred, making it unbeatable if you want to learn about the region’s rich horse culture. The accommodation is high-end country luxury spread over several private houses, while the choice of riding holidays and tours is arguably the best in Andalusia. Of the most enticingly-named of all the routes, the ‘Bar to Bar on Horseback’ takes guests to a number of ‘illegal bars’ on the family’s extensive property, while ‘Riding With The Bulls’ offers a fascinating insight into the centuries-old methods used in rearing cattle in rural Andalusia. 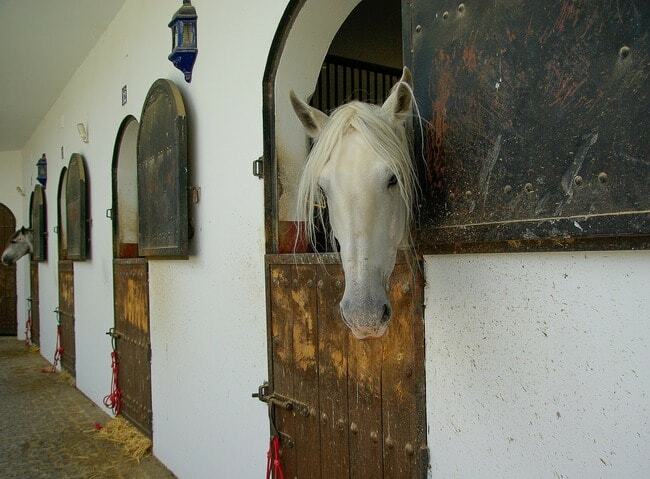 Accommodation at Los Alamos Equestrian Holidays is spread out over nine double rooms in a charming Andalusian farmhouse called Jacaranda, close to the gorgeous whitewashed city of Jerez. From here, you can enjoy all-inclusive riding vacations on the edge of the La Brena Y Las Marisamas Natural Park in Cádiz – an extensive area of slat marshes, lush forest and beautiful beaches. 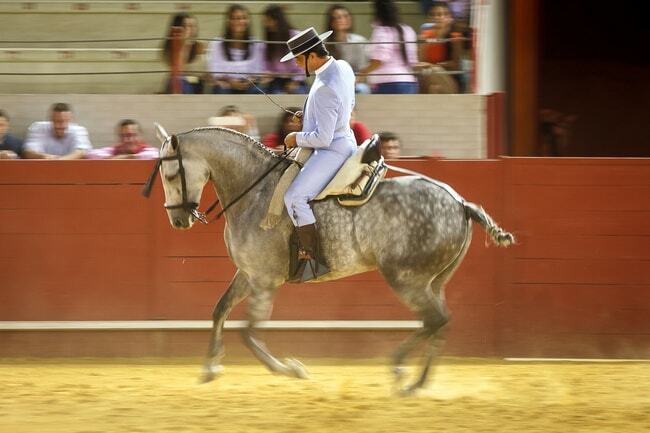 The best packages offer six days of riding in local countryside, broken up with lunches in the area’s many taverns, and a day-trip to the prestigious Royal Equestrian School in Jerez, home to the city’s amazing equestrian ballets.